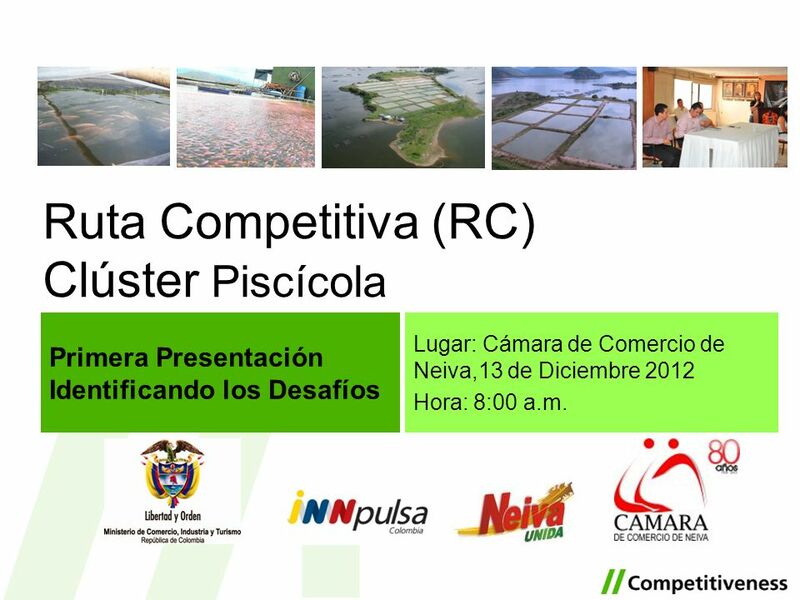 Primera Presentación Identificando los Desafíos Lugar: Cámara de Comercio de Neiva,13 de Diciembre 2012 Hora: 8:00 a.m. 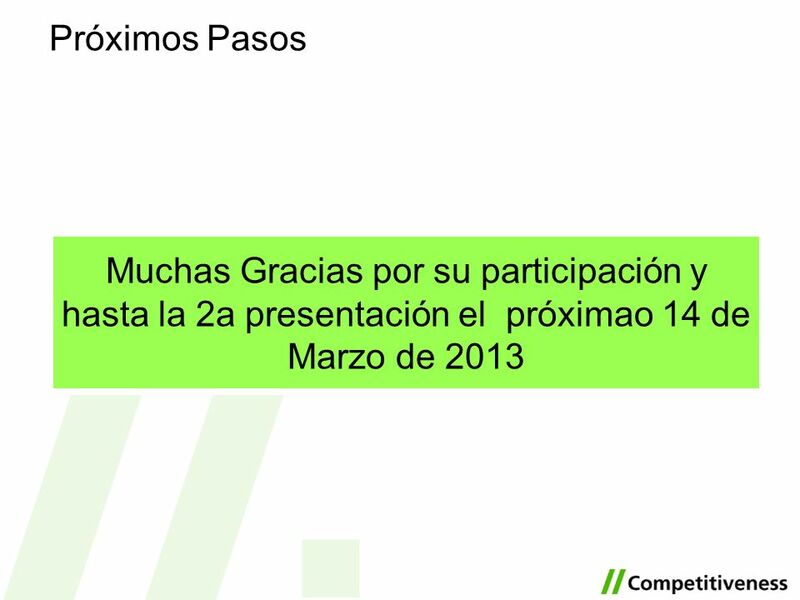 This inicial slide is used by the client to open the presentation by welcoming the audience. The welcome should last approximately 5 minutes and do not need to be supported by slides. 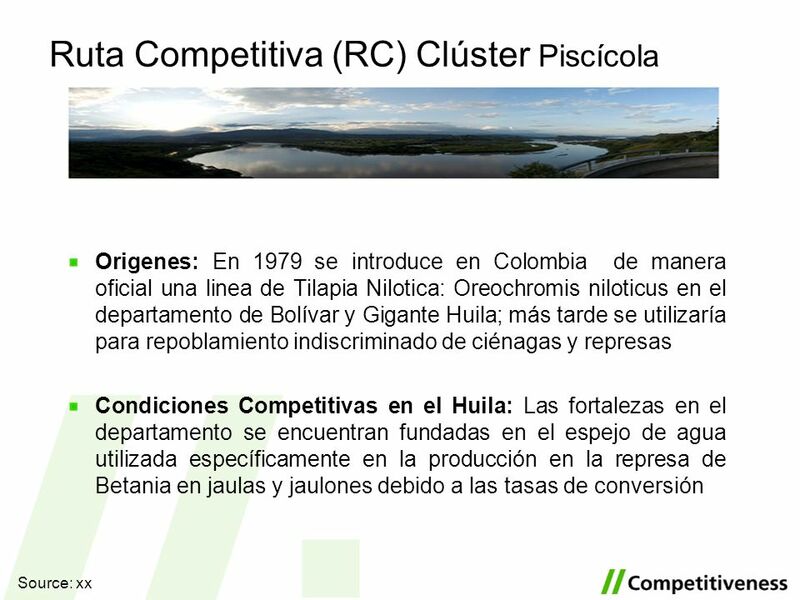 Primera presentación de la Ruta Competitiva del Cluster Psicícola para el Refuerzo a la Competitividad en el Departamento del Huila. 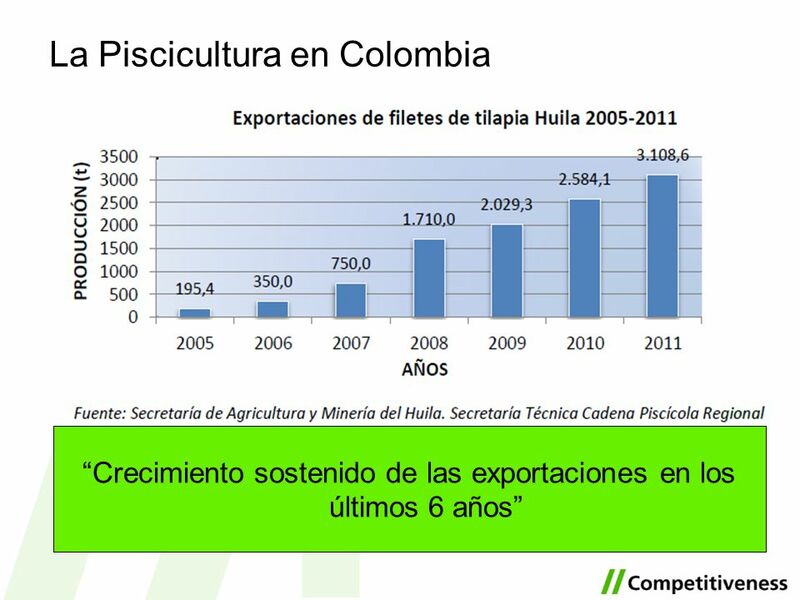 La presente iniciativa ha sido impulsada por la Cámara de Comercio de Neiva y la Alcaldía de Neiva, con apoyo de Innpulsa Colombia y el Ministerio de Industria, Comercio y Turismo. 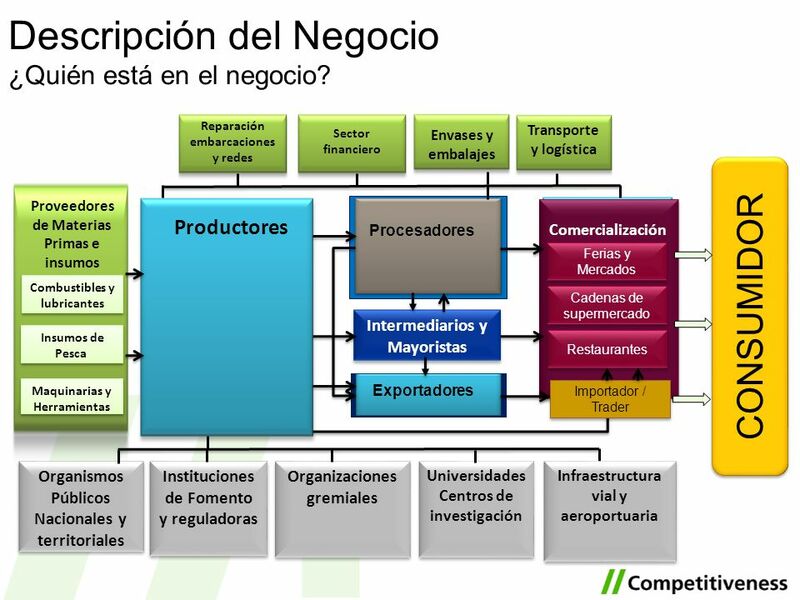 El desarrollo de la iniciativa es acompañado por la consultoría Competitiveness. 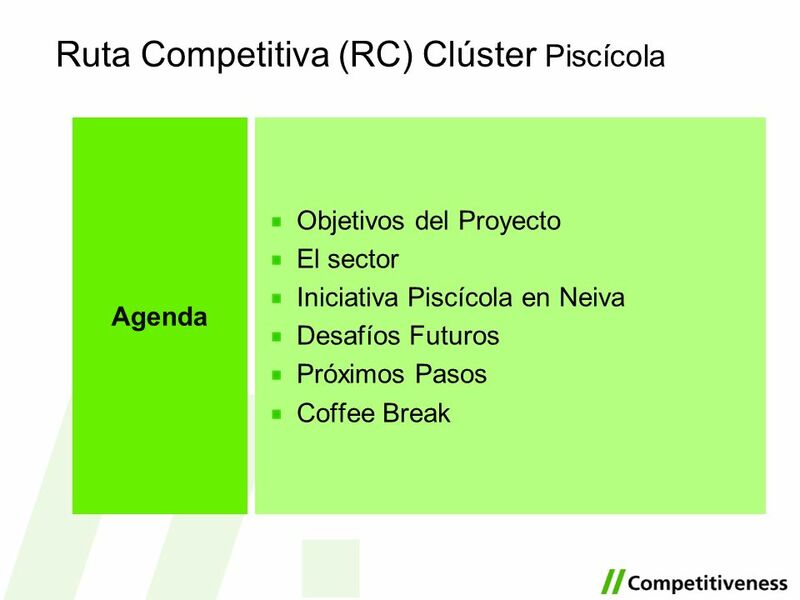 Agenda Objetivos del Proyecto El sector Iniciativa Piscícola en Neiva Desafíos Futuros Próximos Pasos Coffee Break Explain the agenda. Mention (or add a slide) the project website link, so that the audience knows that they do not need to take notes during the presentation. Explain to the audience that there will be a debate after the presentation so that the presentation is not interupted along the way. It is preferable that two consultants take turns presenting, so that it is not always the the same consultant speaking (it also helps keep the attention of the audience). 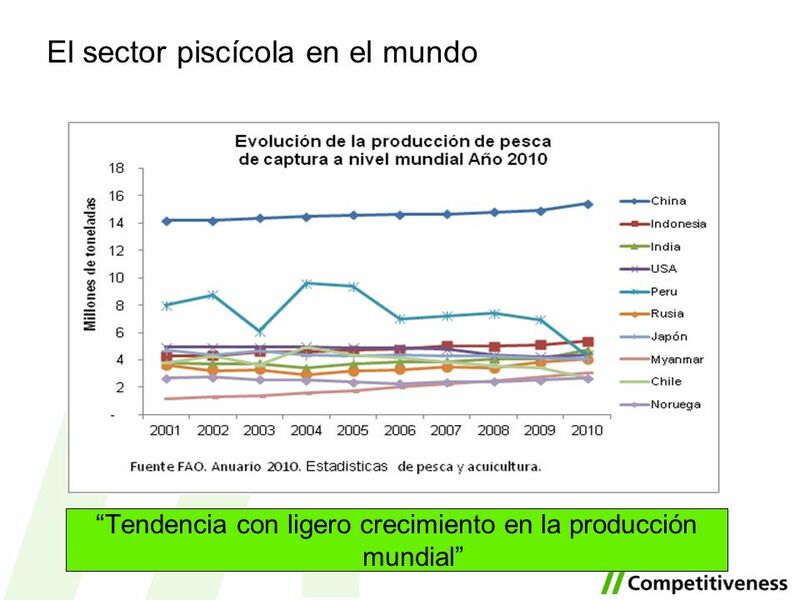 Estos fueron los tópicos presentados durante la reunión: Inicialmente, presentamos cual será el trabajo desarrollado a lo largo de la iniciativa. 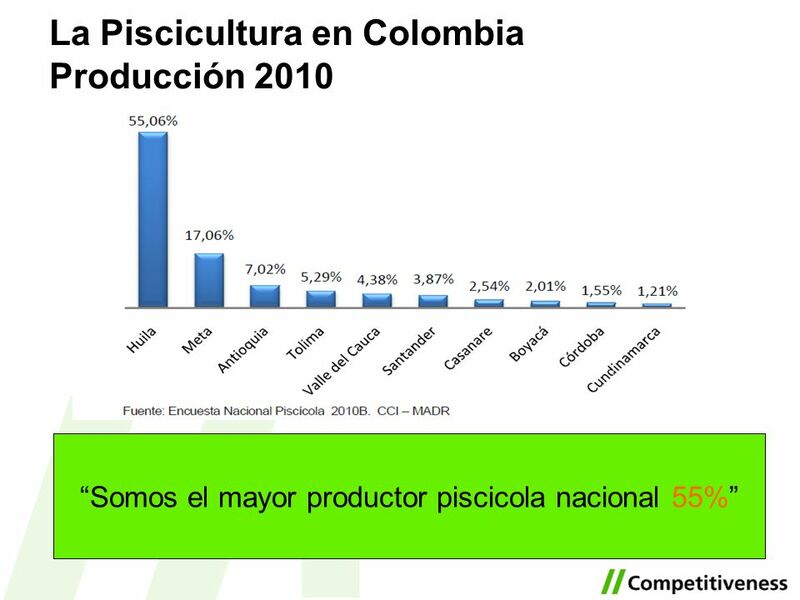 Después de la introducción, presentamos algunos datos sobre el sector piscícola en el mundo, en Colombia y en el Huila. 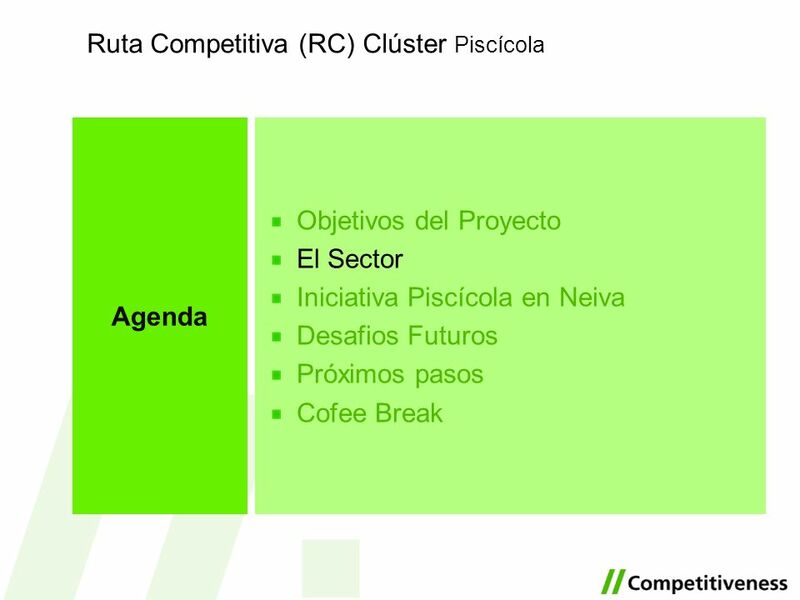 A continuación, abrimos la discusión a todos los presentes para conversar sobre los desafíos futuros para las empresas del sector pisícola en la región. 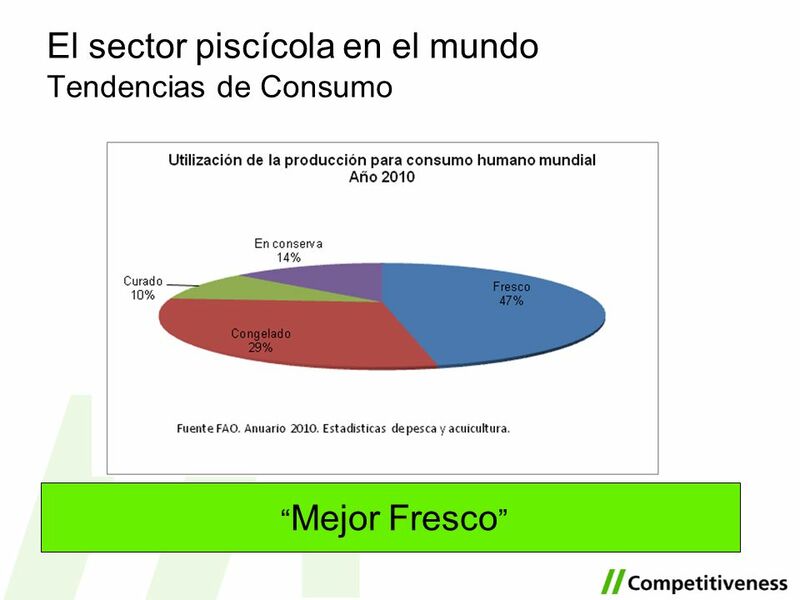 Por último, indicamos cuáles serían los próximos pasos de la iniciativa y convidamos a todos a un coffee break, donde pudimos continuar conversando. Agenda Objetivos del Proyecto El Sector Iniciativa Piscícola en Neiva Desafíos Futuros Próximos Pasos Coffee Break Explain the agenda. 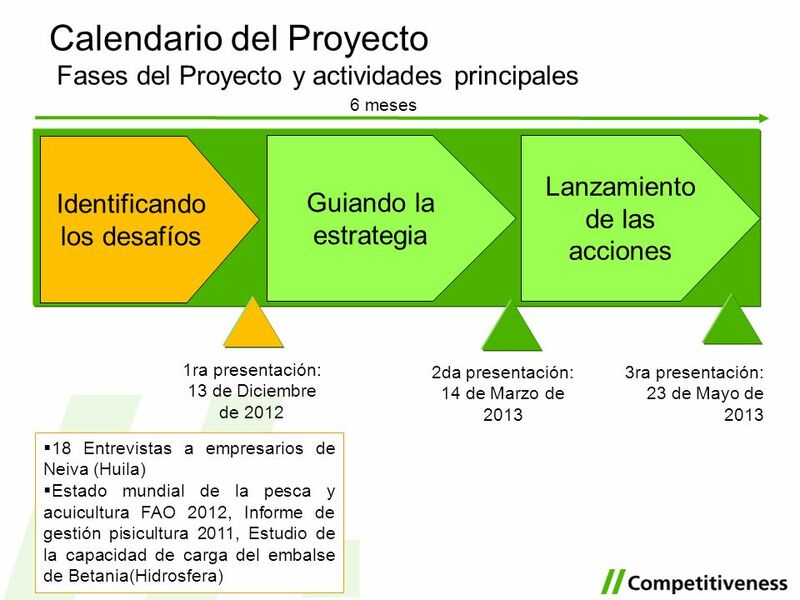 Mention or add a slide with the project website link, so that the audience know that they do not need to take notes during the presentation. Explain to the audience, that there will be a debate after the presentation so that the presentation is not interupted along the way. It is preferable that two consultants take turn presenting, so that it is not always the the same consultant speaking (it also helps keep the attention of the audience). 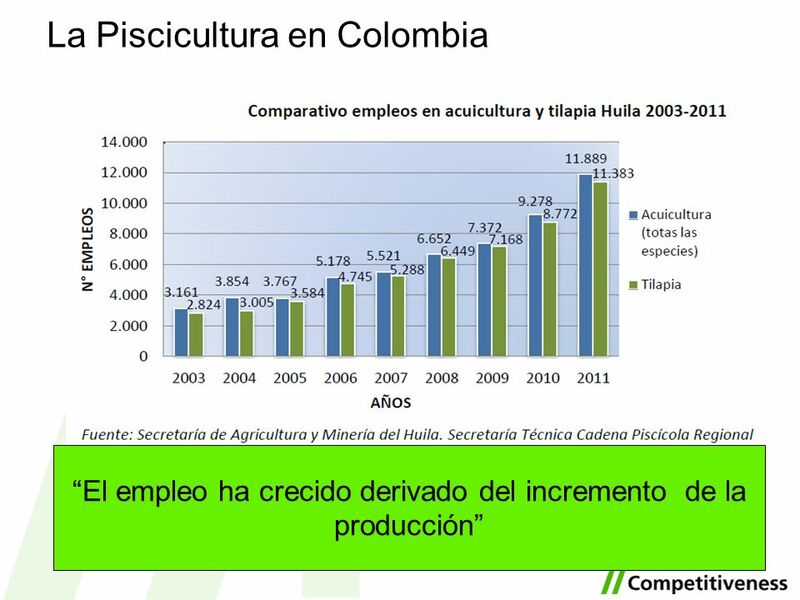 Reforzar la competitividad de las empresas del sector Piscícola en Neiva (Huila) El objetivo de la iniciativa es mejorar la competitividad de las empresas, para ver cómo están posicionados en el mercado y cómo pueden posicionarse más competitivamente con el fin de obtener negocios más rentables. 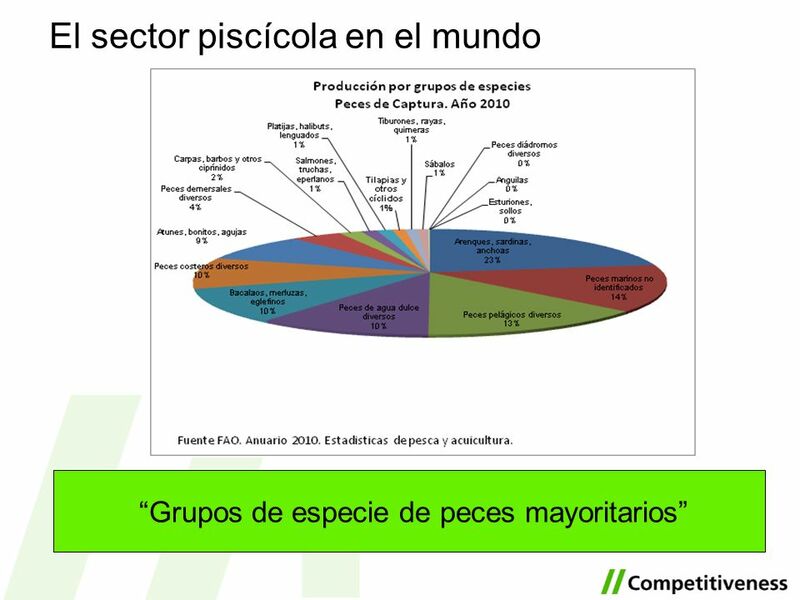 Explicar qué se entiende por competitividad: Una empresa es competitiva cuando logra beneficios más rentables que su promedio de la industria durante un largo período de tiempo. 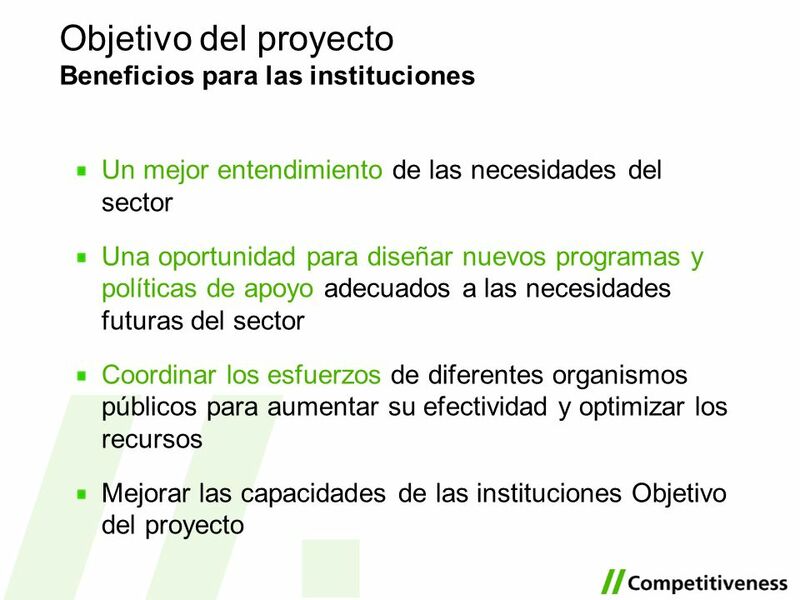 Por último, queremos ayudar a las empresas a ser colocados en las estrategias más interesantes a desarrollar, crear empleo, aumentar los beneficios.El significado de competitividad para nosotros es: obtener más ingresos y un mayor margen al paso del tiempo, es decir, empresas ganando más dinero en el largo plazo. 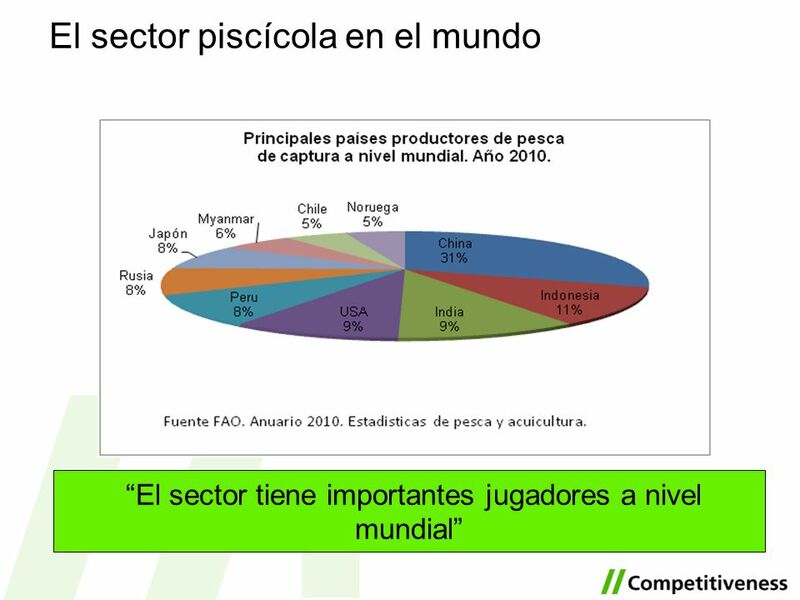 5 Objetivo de la Ruta Competitiva Como se refuerza la competitividad? 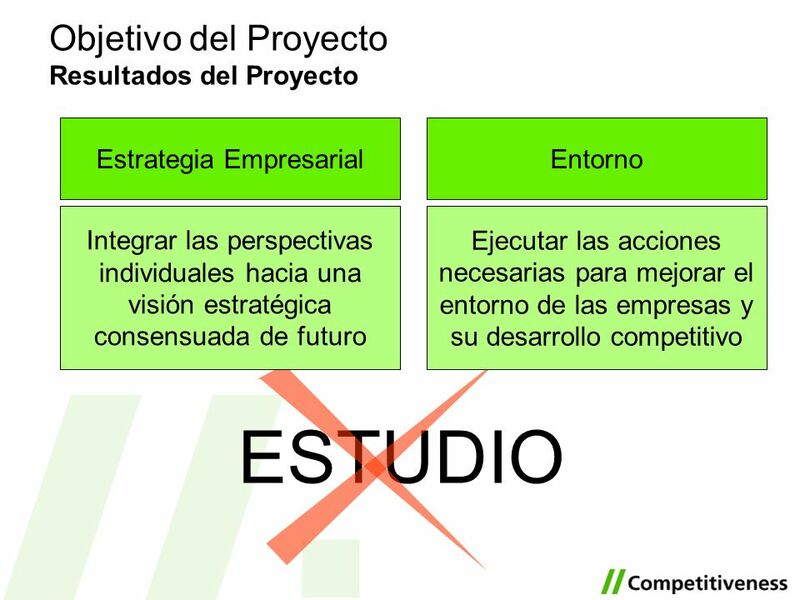 Objetivo del Proyecto Eje de Trabajo Estrategia Empresarial Entorno Integrar las perspectivas individuales hacia una visión estratégica consensuada de futuro Ejecutar las acciones necesarias para mejorar el entorno de las empresas y su desarrollo competitivo Información actualizada sobre las tendencias Referencias Internacionales Reflexión Estratégico Centrarse en areas claves Las estrategias tienen que ser individuales, pero las empresas necesitan un entorno favorable El objetivo es trabajar sobre tres o cuatro áreas claves cada una con un responsable y un plan de trabajo About the environment, the purpose is to launch actions that improve the environment and makes the needs of the companies adequate. Explain bullet point. 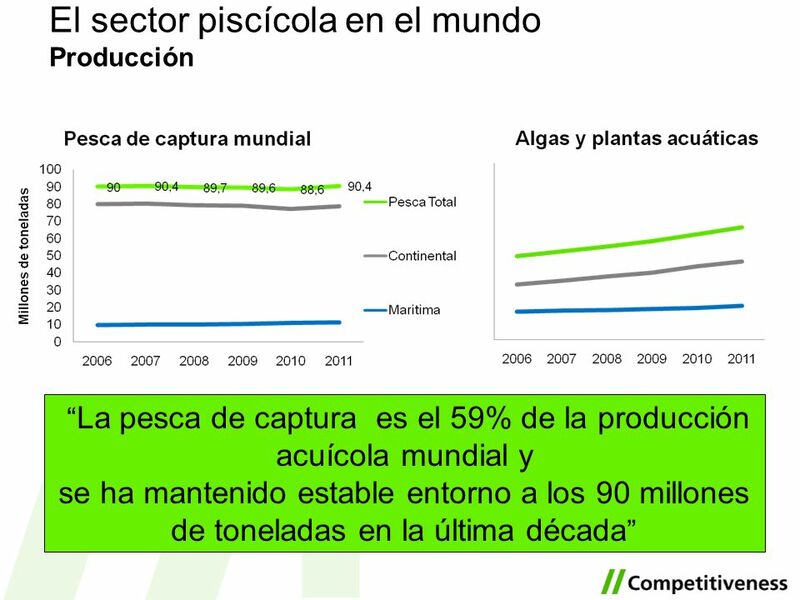 Insist that the cooperation of the businessmen is essential throughout the project, both for the strategy definition where we can be competitive and the definition of the environment actions, which must be implemented. 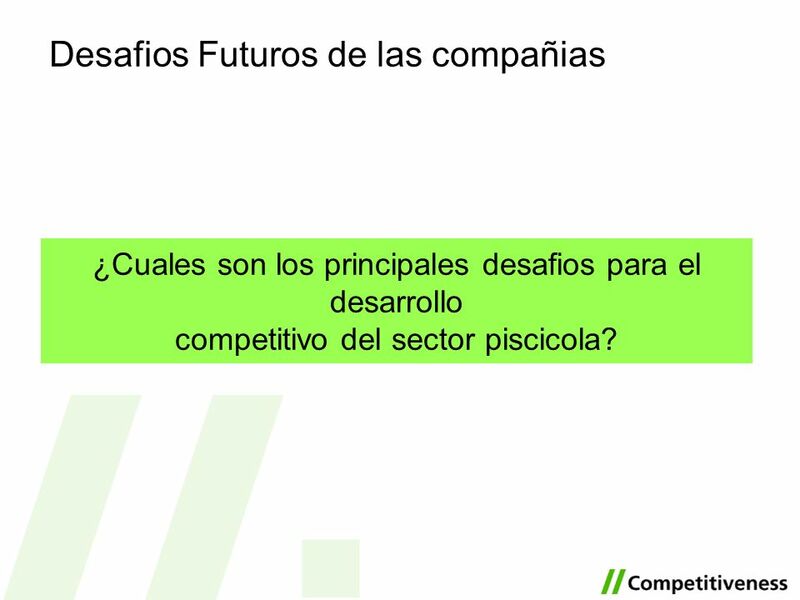 Para integrar las perspectivas para eso necesitamos desarrollar las siguientes acciones Del trabajo de estrategia el resultado son las acciones de mejora competitiva y nos enfocaremos en la principales Caso las empresas decidan realizar cambios estratégicos, será necesario desarrollar acciones sobre el entorno del negocio del cual hacen parte para ayudarlas a desarrollar nuevas estrategias. 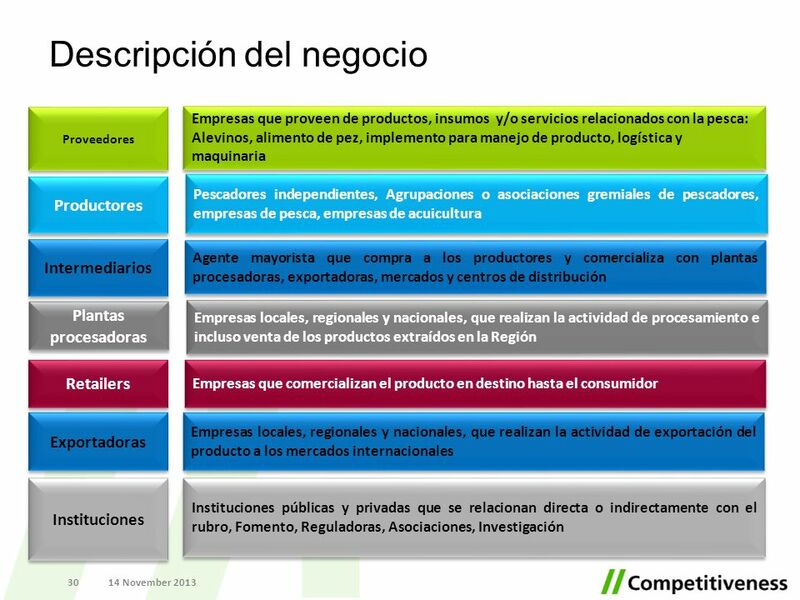 La participación de los empresarios es esencial durante toda la iniciativa, tanto en la definición de la estrategia más competitiva como en la definición de las acciones para mejorar el entorno del negocio. 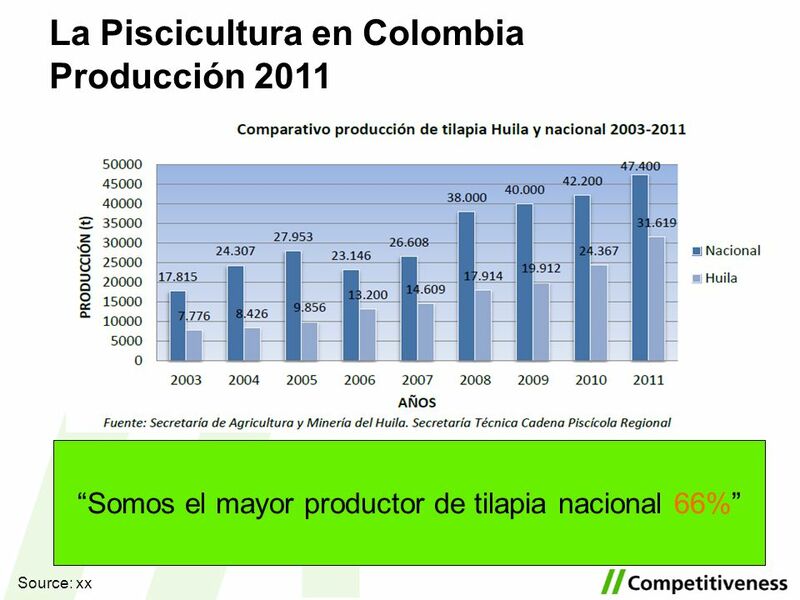 Agenda Objetivos del Proyecto El Sector Iniciativa Piscícola en Neiva Desafios Futuros Próximos pasos Cofee Break Explain the agenda. 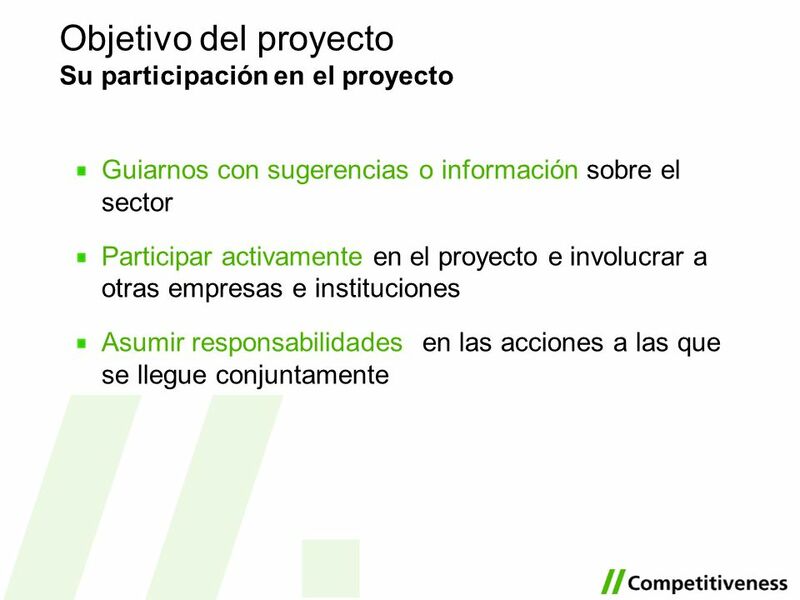 Mention or add a slide with the project website link, so that the audience knows that they do not need to take notes during the presentation. Explain to the audience, that there will be a debate after the presentation so that the presentation is not interrupted along the way. It is preferable that two consultants take turn presenting, so that it is not always the same consultant speaking (it also helps to keep the attention of the audience). Agenda Objetivos del Proyecto El sector Iniciativa Piscícola en Neiva Desafios Futuros Próximos pasos Coffee Break Explain the agenda. 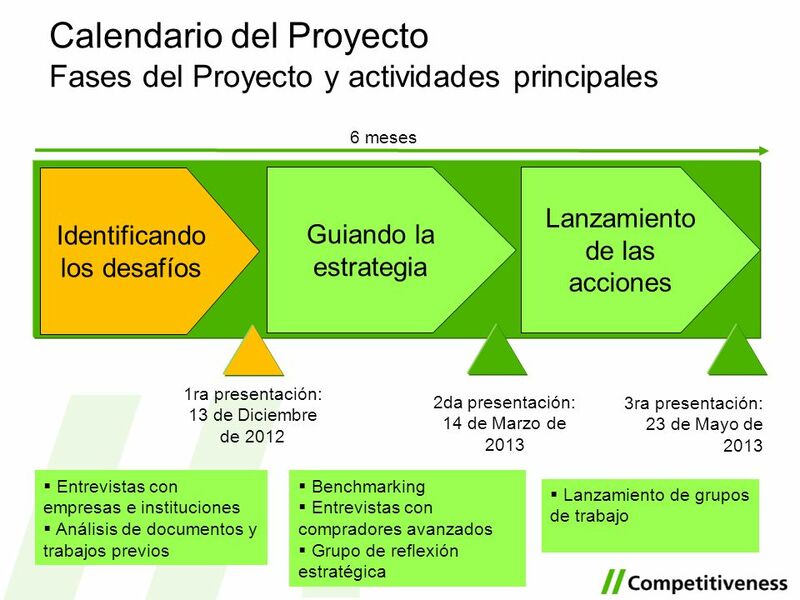 Mention or add a slide with the project website link, so that the audience know that they do not need to take notes during the presentation. Explain to the audience, that there will be a debate after the presentation so that the presentation is not interrupted along the way. It is preferable that two consultants take turn presenting, so that it is not always the same consultant speaking (it also helps to keep the attention of the audience). 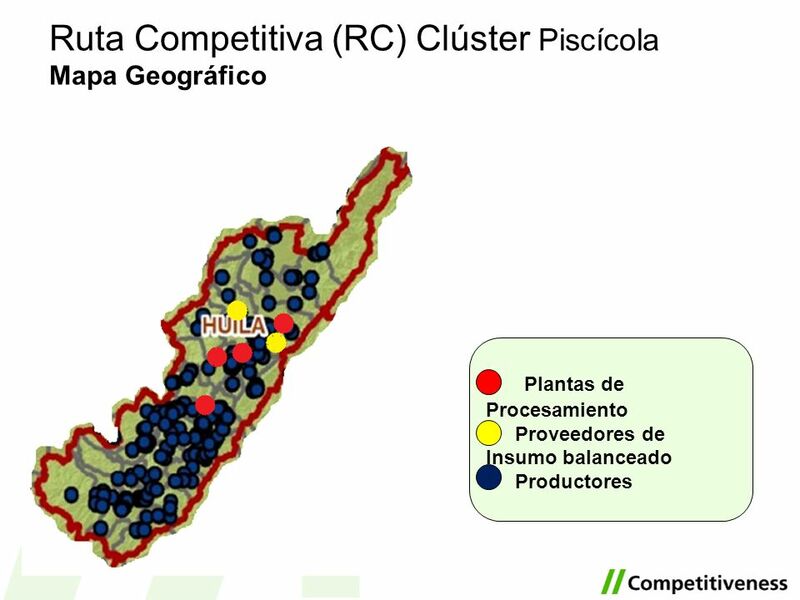 Mapa Geográfico Plantas de Procesamiento Proveedores de Insumo balanceado Productores Show, in a map, how the actors are spread in the territory. 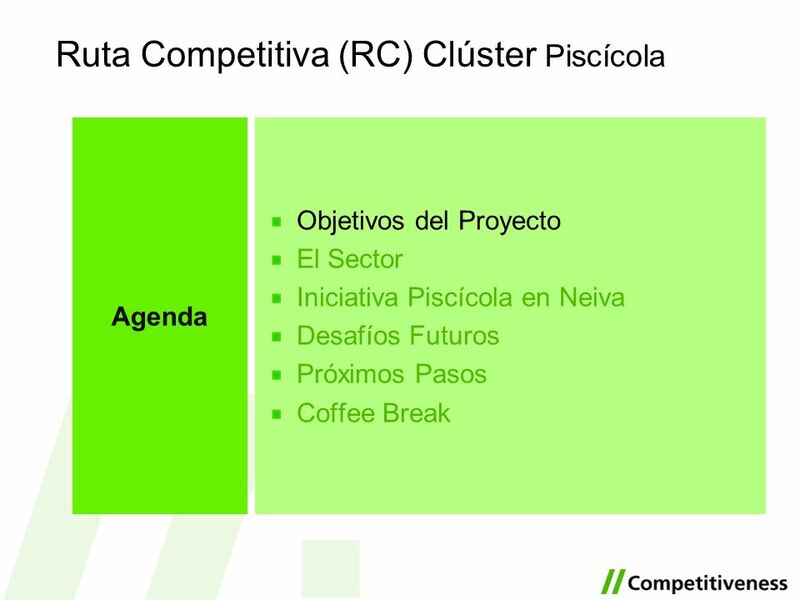 The slide’s objective is to reinforce the feeling of a cluster, highlight the specialization and strengths of the region to motivate the audience to see their potential. Agenda Objetivos del Proyecto El Sector Iniciativa Piscícola en Neiva Desafios Futuros Próximos Pasos Coffee Break Explain the agenda. 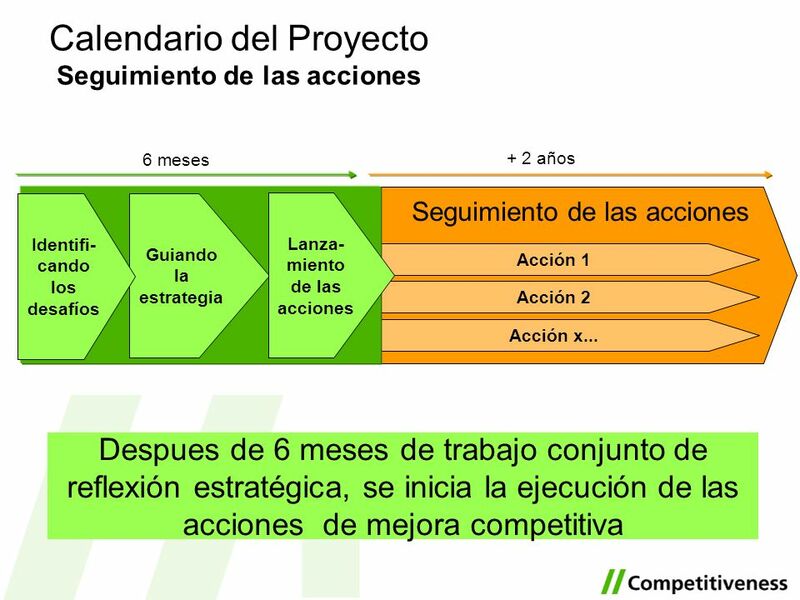 Mention or add a slide with the project website link, so that the audience know that they do not need to take notes during the presentation. Explain to the audience, that there will be a debate after the presentation so that the presentation is not interrupted along the way. It is preferable that two consultants take turn presenting, so that it is not always the same consultant speaking (it also helps keep to the attention of the audience). 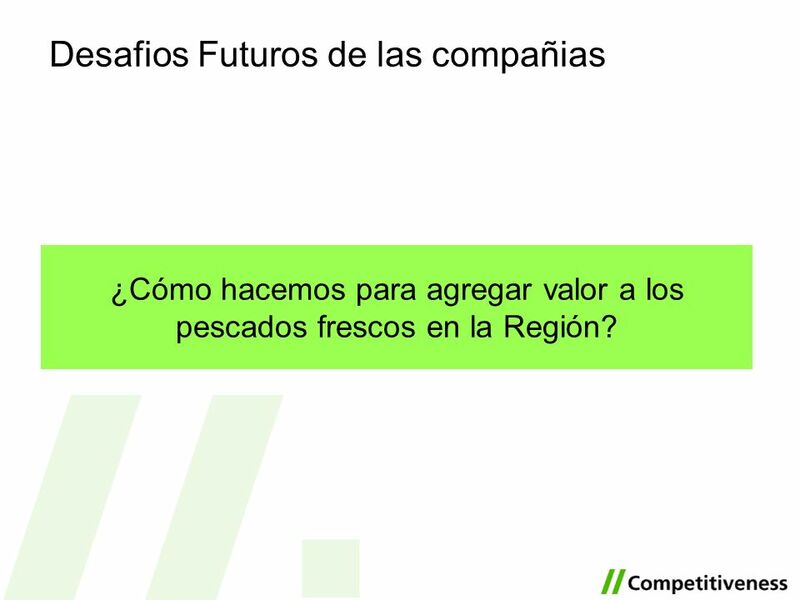 37 ¿Cómo hacemos para agregar valor a los pescados frescos en la Región? 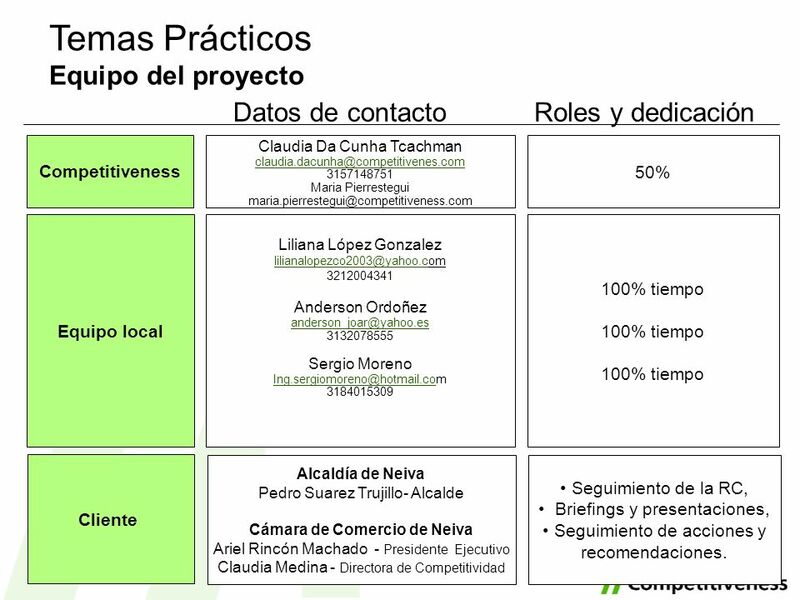 Temas Prácticos Equipo del proyecto Datos de contacto Roles y dedicación Competitiveness Claudia Da Cunha Tcachman Maria Pierrestegui 50% Equipo local Liliana López Gonzalez Anderson Ordoñez Sergio Moreno 100% tiempo Present the team and specify their roles. 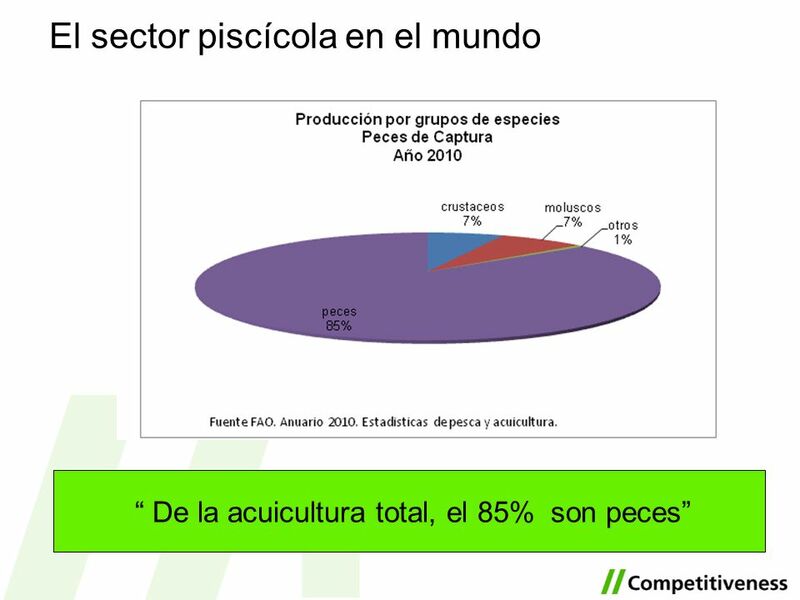 Regarding the local team, different options are possible: One senior (at least 70% of his time, ideally more) and one junior (100%) Two persons at the same level (ideally 100% both, at least 80%) In any case, please, make sure that the local consultants will spend time enough on the project and that they do not have other responsibilities. 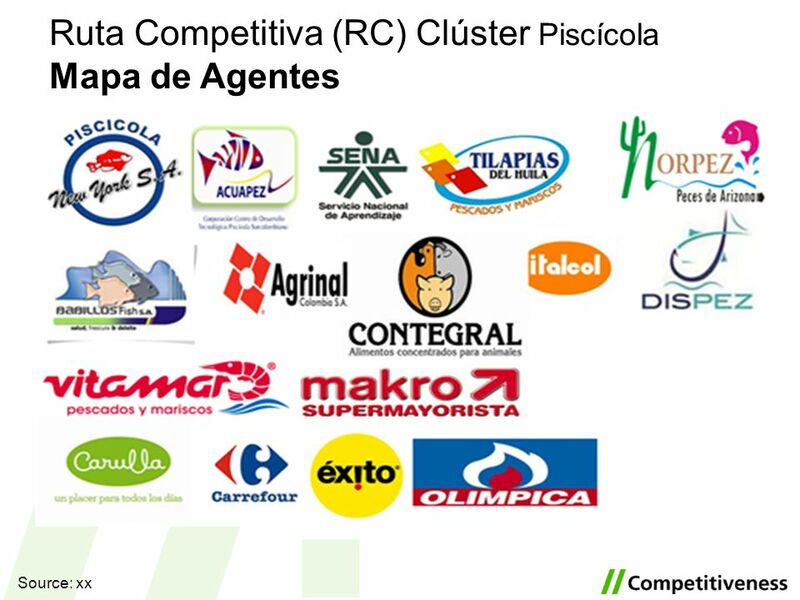 Regarding the competitiveness consultants, please, make sure the client understands their role. Tutor: follow up of all project activities, guiding the team, training them and checking documents to ensure Competitiveness quality level. 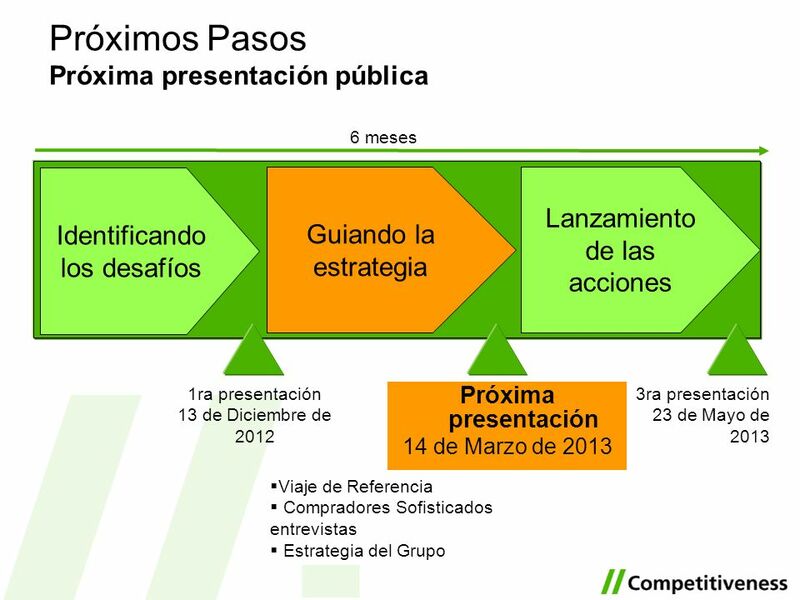 Expert: participation in key moments of the analysis, mainly in phase 2 (strategic segmentation, reference trip,...). 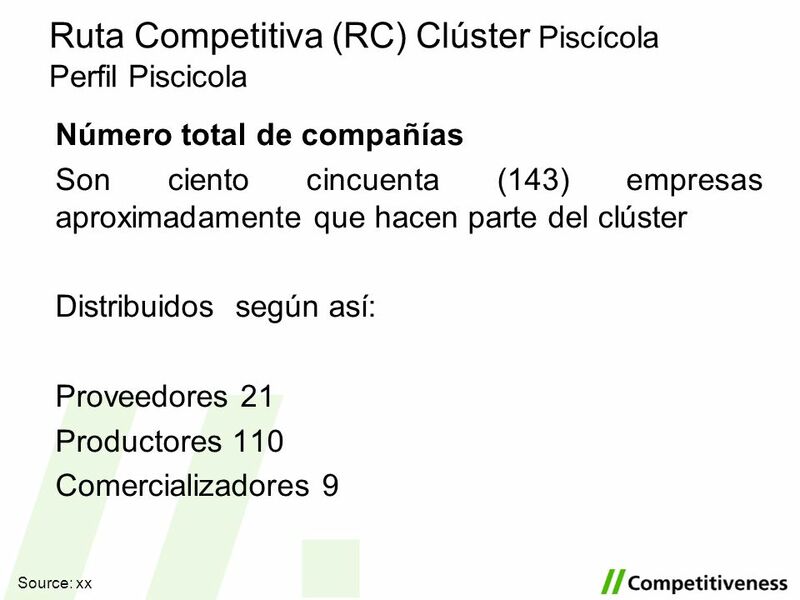 If ever the local team is still to be hired, please, remember that Competitiveness wants to participate in the selection process, to ensure that the people chosen has the necessary skills. As a reminder: both the local consultants have to have a MBA, if there’s a senior, he needs to have 4-5 years experience in the industry. Ideally, the junior should be between 20-25, while the senior should be between Do not hire people with too much experience, it can be more difficult for them to change into a new methodology and listen to a younger tutor. 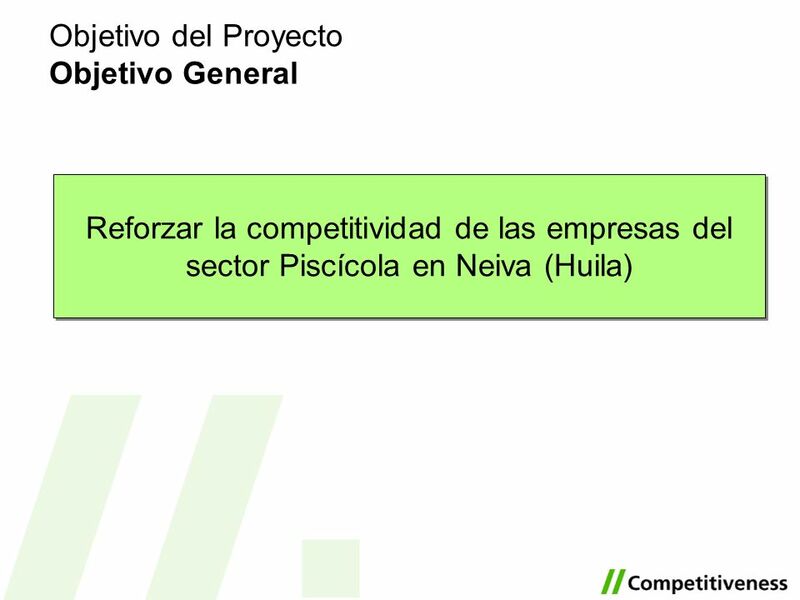 Cliente Alcaldía de Neiva Pedro Suarez Trujillo- Alcalde Cámara de Comercio de Neiva Ariel Rincón Machado - Presidente Ejecutivo Claudia Medina - Directora de Competitividad Seguimiento de la RC, Briefings y presentaciones, Seguimiento de acciones y recomendaciones. 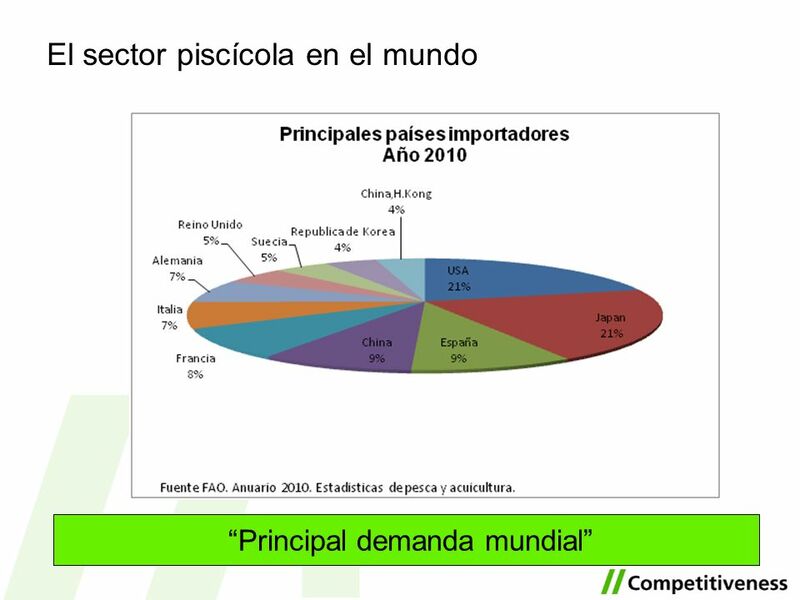 Descargar ppt "Ruta Competitiva (RC) Clúster Piscícola"
La importancia de las Exportaciones de Servicios Lic. 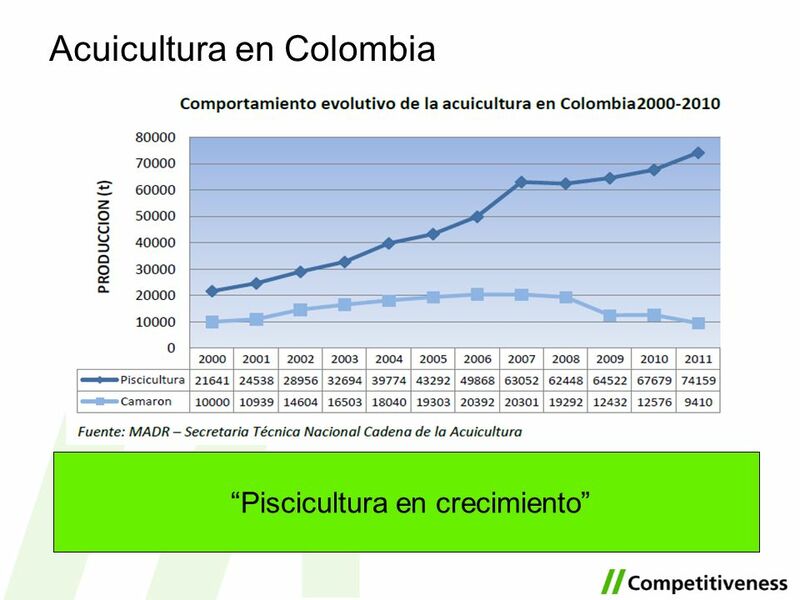 Javier Peña Capobianco.